Two previous attempts by Moscow authorities to permit the construction of mosques have already ended in failure. Despite objections from local residents and rather strong anti-Islamic sentiment in the city, the Moscow authorities have declared intentions to provide land for building more mosques. It will not come as a surprise if those Muscovites who are strongly opposed to the emergence of Muslim places of worship will be turning out for more protest demonstrations. In the meantime, the number of Muslims resident in Moscow has been growing with the influx of guest workers from Central Asia. Moscow authorities are prepared to provide six sites for mosques in various administrative districts of Moscow, the Muslim Board of the European part of Russia said. Three sites, agreed upon after several years of debate, are known already: the suburban areas of Southern Butovo and Lyublino and the area around the Shosse Entuziastov metro station. Muslim communities will be free to build any other facilities they may need, Ravil Gainutdin, chairman of the Muftis’ Council of Russia, told the daily Izvestia. “There will be one mosque in Butovo and another in Lyublino where we have the Moscow Islamic University. In Shosse Entuziastov street we plan to build a third, as well as a cultural centre,” Gainutdin said. “In Moscow, there is a community of 1.5 million Muslims. Divide them by ten districts and it will turn out that there must be at least one mosque per 150,000 parishioners. Each able to hold 1,500,” Gainutdin explained. A source in the Moscow government has confirmed that the three sites have been agreed upon, although the decision is not final yet. “We have ok'd some applications, but now they will have to be discussed with the local residents and prefectures,” the official said. The head of the State Duma’s nationalities affairs committee, Gadjimet Safaraliyev, said that there are various reasons that Moscow must have more mosques, including traffic jams on the days of Muslim holidays. Last September, after protests by local residents, authorities reconsidered plans for building a mosque in the Northwestern suburb of Mitino. A meeting of local residents in Mitino on September 19 escalated into a spontaneous rally. The protest was filmed by several federal television channels and many bloggers. The news of protests against the mosque in Mitino made front-page headlines and triggered a wave of re-posts on blogs and Twitter. The authorities were persuaded by the public outcry and the city’s urban construction and land affairs commission, which earlier agreed with the idea of building an Islamic cultural centre and a mosque in Mitino, cancelled its own decision on September 20. 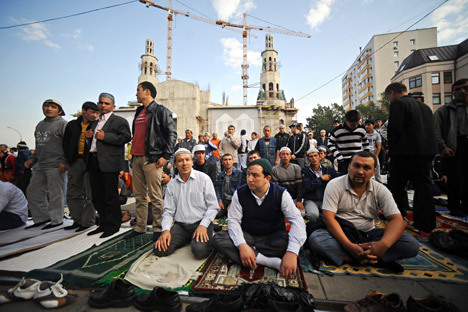 Likewise, in 2010, a petition campaign stopped the construction of a mosque in Moscow’s Tekstilshchiki neighborhood. The question over whether more mosques should be built in a mostly Orthodox Christian country, and how members of various religion and cultures should go about the business of living side-by-side in peace, has been debated in Russia for years. On Muslim holidays, this topic gets particularly emotional. A large share of Russia’s Slav population is strongly against allowing Muslims, particularly guest workers, to celebrate their holidays, with the accompanying religious and ethnic rituals, on city streets. They argue that large crowds gathered for these occasions interfere with the normal course of life in the city. In response, the critics say simply – build more mosques and worshipers will not cause any trouble. Without more spacious places of worship available, Moscow is doomed to suffer from “Muslim” traffic jams once in a while. However, many say that adding more mosques will also be a hindrance. Society is split over the issue. Nobody knows for sure how many Muslims there are in Moscow these days. According to the 2002 population census, Moscow is home to approximately 400,000 Muslims and up to eight million Christians. However, unofficial sources estimate far greater figures--up to 4.5 million Muslims. This statistical inconsistency is so great because many of these Muslims are illegal migrants. Moscow currently has six mosques and hundreds of prayer rooms. Christian services are held in 882 churches and chapels. “Generally speaking, it is not right to put people adhering to other religious views in the position of outcasts,” Albats said.